Christmas is a time for following the Savior and giving as he gave, said President Howard W. Hunter during the annual First Presidency Christmas devotional. “The Savior dedicated his life to blessing other people,” President Hunter said. “As expressed by his chief Apostle, Peter, ‘God anointed Jesus of Nazareth with the Holy Ghost and with power: who went about doing good’” (Acts 10:38). President Hunter’s counselors, President Gordon B. Hinckley and President Thomas S. Monson, also addressed the thousands gathered in the Tabernacle and Assembly Hall on Temple Square at the December 4 service. 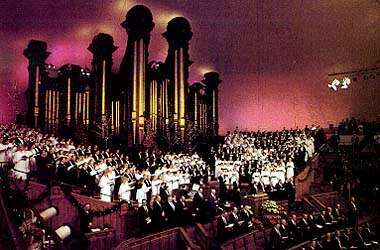 The devotional was broadcast over the Church satellite system and KBYU. President Hunter shared a story of a man who couldn’t think of any gifts to give for Christmas. The next day he received an anonymous list in the mail. “This Christmas, mend a quarrel,” President Hunter suggested. “Seek out a forgotten friend. Dismiss suspicion and replace it with trust. Write a letter. Give a soft answer. Encourage youth. Manifest your loyalty in word and deed. Keep a promise. Forgo a grudge. Forgive an enemy. Apologize. Try to understand. Examine your demands on others. Think first of someone else. Be kind. Be gentle. Laugh a little more. Express your gratitude. Welcome a stranger. Gladden the heart of a child. Take pleasure in the beauty and wonder of the earth. Speak your love and then speak it again. Christmas is a celebration, and there is no celebration that compares with the realization of its true meaning﻿—with the sudden stirring of the heart that has extended itself unselfishly in the things that matter most (see McCall’s Magazine, Dec. 1959, pp. 82–83). “A life filled with unselfish service will also be filled with peace that surpasses understanding,” President Hunter continued. “This peace can come only through living the principles of the gospel. These principles constitute the program of the Prince of Peace, who is also the Prince of Glory and the Prince of Eternal Progress,” he said. “Marvelous is the chronicle that began with the singing of angels at Bethlehem and ended on Golgotha’s cruel cross. There is no other life to compare with His life. He was the one perfect man to walk the earth, the paragon of excellence, the singular example of perfection. “I looked at his weeping widow and children,” he continued. “They knew, as I knew, that never again in mortality would they hear his voice. But a tender sweetness, indescribable in nature, brought peace and reassurance. It seemed to say: ‘Be still, and know that I am God’ (Ps. 46:10). “When all is said and done,” President Hinckley concluded, “when all of history is examined, when the deepest depths of the human mind have been explored, there is nothing so wonderful, so majestic, so tremendous as this act of grace when the Son of the Almighty, the Prince of his Father’s royal household, he who had once spoken as Jehovah, he who had condescended to come to earth as a babe born in Bethlehem, gave his life in ignominy and pain so that all of the sons and daughters of God, of all generations of time, every one of whom must die, might walk again and live eternally. “This is the wondrous and true story of Christmas. The birth of Jesus in Bethlehem of Judea is preface. The three-year ministry of the Master is prologue. The magnificent substance of the story is his sacrifice, the totally selfless act of dying in pain and dishonor on the cross of Calvary to atone for the sins of all of us. “The epilogue is the miracle of the Resurrection, bringing the assurance that ‘as in Adam all die, even so in Christ shall all be made alive’ (1 Cor. 15:22). Also an annual tradition, explained President Monson, was the drawing of names in the local school for gift giving. “That year, as the names were drawn as usual, Gene knew he would be happy with any name as long as it wasn’t Charlotte’s. No one wanted to draw her name. She was not as cute as the other girls, and her clothes were torn and dirty. All of the children tried to avoid her. Gene’s mother worked extra hard in the potato fields that year so that Charlotte could have a special present. Anger filled his heart when his mother showed him the beautiful porcelain doll she had purchased. “He knew that even his own sister had never received anything quite so special. 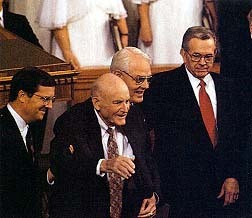 This was surely too good for Charlotte!” President Monson continued. Each of the gifts was opened until only Charlotte’s was left. The teacher picked up the gift and took it to Charlotte. “As she carefully began to open the present, Charlotte’s hands shook. All eyes were on her. As she reached into the box and carefully lifted out the doll, tears began to fall from her eyes. She held the porcelain doll to her heart and caressed it and rocked back and forth, back and forth. Charlotte felt loved! Gene had to choke back the tears, as did everyone else in the class that day. Each one felt the true Christmas spirit,” said President Monson. At the conclusion of the First Presidency Christmas devotional, President Howard W. Hunter waves to those in attendance. Pine boughs decorate the Tabernacle.